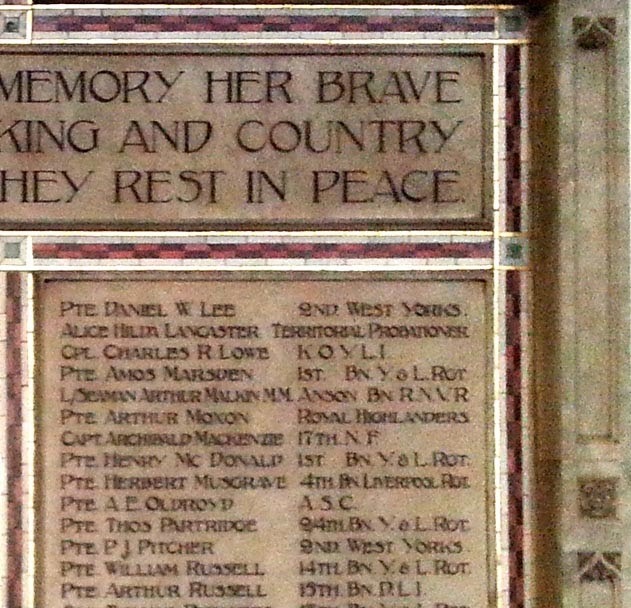 Alice Hilda Lancaster's name is proudly listed on the War Memorial tablet in St Paul's church in Monk Bretton. When I visited last weekend the Vicar and a parishioner were both at pains to point her out - and yes, it isn't that common to find a woman's name listed on a War Memorial. Alice was the youngest daughter of Thomas Lancaster, a well off local business man, an auctioneer and valuer. His brother and thus Alice's uncle, was E G Lancaster Esq of Keresforth Hall, Barnsley who endowed St Edward's church at Kingston. Alice had two older sisters, Rose and Edith and two older brothers, Thomas Edward and George Bingley. Alice's mother had died in 1895 under circumstances which I am sure were very distressing for the family. It seems that she had been ill for some time and died after undergoing a surgical operation in Wakefield. The newspaper cutting to the left states that the operation was a success, but that afterwards she showed signs of collapse and "sank rapidly". This suggests that she may have died of some kind of infection as a result of the operation. As Alice was born in 1883 she would have been just twelve years old when her mother passed away. Did her elder sisters become mothers to the family? Neither ever married, but then neither did either of her brothers, which I find a bit odd for a well off middle class family of the time. The family can be found in the 1901 census at Cliffe House, Monk Bretton and were at 111 Dodworth Road, Barnsley ten years previously. Before the move to Monk Bretton the family's local church had been St George's on the edge of Barnsley town centre. That is where Alice and most of her siblings were baptised. Alice's mum is buried in Monk Bretton and it confirms in the newspaper report that they had moved before 1895 although in the report of her death it mentions Rock House, rather than Cliffe House. Are they the same place? If you are familiar with Barnsley you will know that there would be a wonderful view across the Dearne Valley from their house, which would have been at the top of the outcrop of rock that the road now swings out around going up towards the church from the junction of Burton Road and Rotherham Road. Thomas Edward Lancaster, Alice's eldest brother died in 1909 aged 31 in Manchester and is buried in Monk Bretton cemetery with his mother. I wonder if he was on business there? I could find nothing in the newspapers on Find My Past about his death as the editions of the Sheffield newspapers for 1909 are missing. The gravestone on which Thomas and his mother are remembered is also where Alice herself is remembered, but she does not lie there with them. When war broke out in 1914, Alice would have been 31 years old and unmarried. Newspaper reports after her death note that she was "prominently engaged on social work" and had many friends in Barnsley and district. She works at the Lundwood Military Hospital, which had previously been an isolation hospital, until 1916 when presumably now a fully trained nurse in the Territorial Force she moves to London to work at St Thomas' hospital. Thanks to an old acquaintance from Barnsley Family History Society, who obviously knows his way around these kinds of records and wrote a short piece himself about Alice last year, I now have a copy of Alice's nursing records which cover the period from her applying to go overseas to serve as a nurse in France. It gives details of her application and approval to serve overseas and then sadly a full investigation into the circumstances of her death just over a week after she arrives in France. 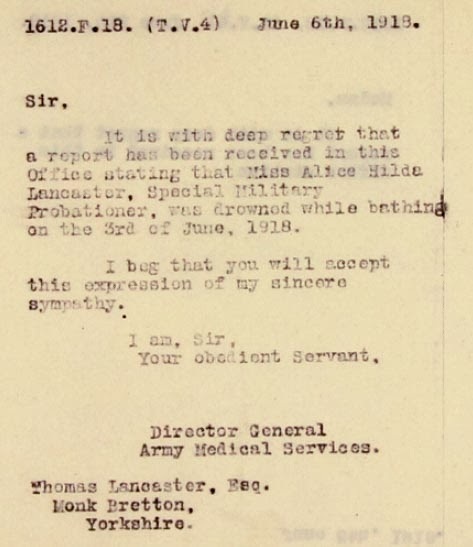 It is June 1918, maybe the weather is warm, Alice and a fellow nurse decide to go for a swim at Wimereux after their shift at the hospital is over. There are other people about, some soldiers nearby. I wonder what Alice and her friend were wearing to swim in? 1918s bathing costumes were bulky but left the arms and legs bare below the knee as far as I can discover. There's a picture here. According to the Proceedings of the Court of Enquiry held after her death both Alice and the friend were caught in a powerful current, the friend barely made it back to shore but when she turned back to look for Alice she was just in time to see her vanishing below the waves. Another witness said that, "She threw up her hands and screamed and disappeared". Some soldiers took a boat out as quickly as they could to try to find her, but they found no trace and apparently the boat they had 'borrowed' was leaking like a sieve so they had to return to the shore shortly afterwards. The writing of the report is difficult to make out, but it does conclude that Alice had accidently drowned and decided to place a ban on bathing at the beach until a suitable safety boat can be provided. A telegram was sent to Alice's father, followed by an official letter of condolence. Her body must have been recovered at a later date as she is buried in the Wimereux Community Cemetery and is remembered on the Commonwealth War Graves Commission website. There is a picture of Alice's gravestone on this website, which has a lot of information on nursing in the First and Second World War. I thought there might be a decent obituary for Alice in the local Barnsley newspapers, but found in a similar story in both the Chronicle and the Independent. Fairly short and to the point and without a photo, I was a bit disappointed that a woman who after all did die whilst on war service was given much less coverage than the soldiers reported in the same issue of the papers. I have transcribed the piece and you can read it here on her page linked to the Barnsley War Memorials Project. Alice's brother George Bingley served in the war too, and was badly wounded in 1915 when a Lieutenant in the Green Howards. He was later promoted to Captain and I already knew that he survived the war as I have seen mentions of him in the local papers, unveiling a memorial tablet in Monk Bretton Working Men's Club for example. Thomas Lancaster senior died in 1930 leaving over £60,000 in his will and Alice's remaining siblings appear to have remained at Cliffe House together until their deaths in the 1950s. All are buried in the adjacent plot to Alice's mother and brother in Monk Bretton Cemetery. Cliffe House is no more, instead there is a small housing estate on Cliffe Court on the site, although a gatehouse appears to survive. As none of the family married there were no descendants of Thomas and his children to inherit the considerable quantity of money left by George, who outlived all his family. It would be very interesting to see if he became interested in helping the miners and working classes in Barnsley - in his speech at Monk Bretton Working Men's Club he does mention that his opinion of them had changed after spending time in the trenches amongst them. I found this reference online which suggests he did leave money to charity. I would have loved to have found out more about Alice Hilda Lancaster's family, but I think that it might be way, way beyond the scope of my blog! And certainly straying off the topic of the First World War.